Optimized to increase service life. SKF Energy Efficient (E2) deep groove ball bearings can provide more than twice the service life while reducing energy use and total cost of ownership. 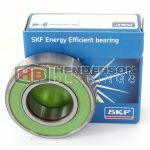 Design improvements reduce frictional losses in the bearing by at least 30% when compared to the same size SKF Explorer bearing. This results in energy savings over the life of the application.